finally, another company christmas party that i was able to attend! heheehe, i don't really attend xmas parties before...why? coz i don't like dressing up in parties and presentations! 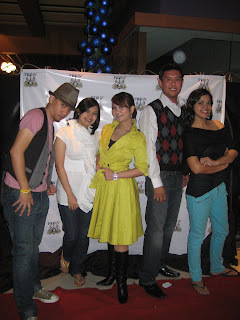 last year, when i was still with AWWC, me and my bestfriend attended the party...actually, the whole IT team did! it was very unusual since most of the time, they find IT people hmmm, kill joys? lol. but last year, we decided to attend and me and my bff really dressed up! she even won for best in costume! our theme then was 80's. congrats! hehe you really did strut that outfit very nicely! LOL you are so cute! :) Love it! hey! where did you get your trench coat and the black dress? i love it. Cute! :D really great outfit. Oh wow sis! You look absolutely amazing in that outfit. I feel a proud big sister watching you strut that outfit... and awww.... those Dou boots! You definitely rock sis! We should party together one day ha ha ha!